Istanbul: Renowned Radio, television and film actress Roohi Bano passed away in Turkey Friday after a prolonged illness. She was 67. 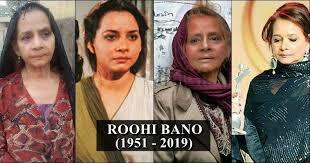 Roohi Bano was under treatment in Turkey as she was suffering from kidney failure. She was born in Karachi on 10 August 1951. Roohi Bano was well-educated and was also awarded the presidential pride of performance award.